Protectors will prevent cracking and lost labels as well as reinforce tabs and spine edges. Can also be used "flat" to attach miscellaneous materials to any surface. 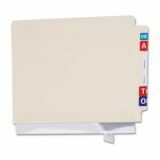 Tabbies Self-Adhesive Label/File Folder Protector, Strip, 2 x 11, Clear, 100/Pack - Tabbies edge protectors keep heavily used file folders looking good longer by protecting edges from cracking or splitting. 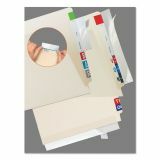 The wraparound protector is easily applied to the bottom edge of a file folder, where the most wear and tear occurs.